Suitable for a campaign starter, this adventure takes a party of very low level adventurers (1st-3rd level) to a frontier keep that's troubled by a curse and assorted marauding beasties. There's plenty to find in (and around) the keep, which is surrounded by an area called the Wilds. Shall we say that it lives up to its name. Several hooks are provided to get them there in the first place, and it's suggested that you make use of whatever backstories the characters have. There's also a selection of rumours - each charater should have heard a couple of them before the adventure begins. There's a background story - some of which might come out during play - and notes about what the party needs to find and what they should do with them. The local lordling will be pleased to get them back... but of course, other folk also have their eyes on the prize! We also find out a fair bit about the area of Wildsgate and the people living there, a vibrant community in which any action will have consequences. It's somewhere a bunch of aspiring adventurers might want to stay a while as they begin their careers, and there are some outline notes that give ideas for integrating your adventures into the locality. The adventure begins with the party on the road towards the keep... and an introductory combat to remind them that civilisation is far behind. There's plenty more travel in the Wilds before they reach the keep too, and plenty to do and see on the way. The really neat thing is that every encounter happens for a reason, even though they are universally violent and hostile. Eventually they reach the keep, which is well-guarded. The first task is to get in! Within its confines there is plenty going on. It's quite a hub of adventurer activity, and there are lots of folks to interact with. However the lure of adventure will hopefully lead the party forth again, to the caverns beneath a feature called the Goblin Spires, where there are some well-organised goblins to be cleared out... and of course there is much more besides, beneath and beyond. Eventually the quest reaches its end in ancient dwarven tombs, needless to say, well-protected against tomb raiders. Those defences don't care how legitimate the party's business might be, ether! 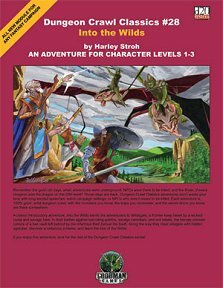 Well-resourced with maps, descriptions and everything you might need to make the Wilds and the settlement of Wildkeep come alive, this makes an excellent start for a wilderness-based campaign. Return to Into the Wilds page.